The deals change every few hours, and you can keep track of what's available by clicking here. You need a Swagbucks account to take advantage - fortunately, it's free and takes less than 30 seconds to sign up. PLUS, if you sign up through me you'll get a bonus 300 SB ($3) if you earn 300 SB before December 1st! I have been with Swagbucks for years and earned almost $1,000! I just got 70 SB yesterday when I ordered Callie some leggings on OldNavy.com. I also get SB when I order things from Target for Christmas shopping and Eva's birthday! 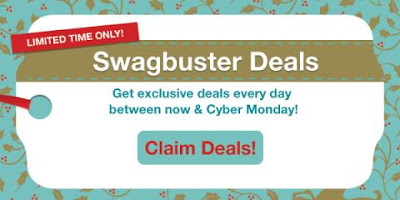 Christmastime is really a great time to join Swagbucks and start earning cash back!